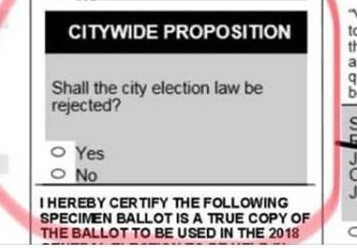 Answering YES means that all elections will be handled by the Elected County Clerk’s office and the Bloomington Election Commission is abolished. Republicans believe government’s power should lie with the people not insiders. If the County Clerk isn’t doing a good job, voters can replace that person. Voters have no control over an Election Commission because they are appointed. Claims that they are non-partisan are as valid as claiming the Bloomington and Normal Councils are non-partisan. Everybody knows both are controlled by Democrats. Keep in mind it was the BEC Board Chair, an admitted Democrat, who challenged this referendum in court and lost. Abolishing BEC has many benefits besides giving voters control over elections. Paying for duplicate staff, duplicate offices, duplicate training, and duplicate conferences is a waste of taxpayer dollars. Voters deserve a clear line of accountability, voting YES does that. Connie Beard produced a list of campaign contributions showing JB Pritzker is funneling money to local Democrats through the Rock Island Democrats. Tens of thousands of dollars are being spent by local democrats for races that normally cost a few thousand. Chicago politics is buying local votes, that’s why every Republican voter needs to vote! Connie again asked Nitika to apologize for her church comments saying Kathy broke the law by delaying early voting and uses trickery with mail in ballots. She demanded Nikita contact the State’s Attorney with her evidence if a crime really occurred. Since Nikita hasn’t, it’s more proof she is lying. Actually, the State’s Attorney approved both the County and BEC delaying early voting, just like many other State’s Attorneys did around the State. One item came up I was not aware of. The damage to Kathy’s computer because of a rainstorm happened on a weekend. The County IT department wasn’t open. She immediately took it to Best Buy since another option wasn’t available. No data was lost so any “on purpose” destruction claims are irrational. Posted in BloNo, Bloomington, elections, Liberal Media, Local, McLean County, Normal, Taxes.Tagged BEC, Bloomington Election Commission, buying votes, Connie Beard, JB Pritzker, Kathy Micheal, McLean county Republicans, Nikita Richards, referendums. Can you imagine what that office would be turned into if she is elected? We can’t let this cancer into our city government… we already need a massive dose of New People Radiation to get rid of most of the elitist tumors we have now. The last thing we need is a Chicago Diversity Darling Tumor to start metastasizing in our government. While I like the idea of asking about the state real estate tax….the vote is meaningless for a couple of reasons. 1) It is not binding…..
2) More IMPORTANTLY non-real estate owners are allowed to voice their opinion. Hell, I would say yes to “stick it” to those nasty undeserving bastards that own land as it will not cost me a penny. After all they got it thru hard work and saving money….in most cases it wasn’t handed to them (Unless your name is silver spoon in mouth Prickster or given to you by some government assistance program) and we are a society of supporting dependance on others while doing no work to get that “Participation Award”. Our forefathers had it partially right when only landowners were allowed to vote. At least make it so you have some part of you or something you own is affected by the results of the vote. Non-real estate owners should NEVER be allowed to vote on school referendums and the like, or change all funding for schools and the like to come from sources other than real estate. Lawrence makes a GREAT point. Nikita took a class on how to CAMPAIGN. She didn’t take a class on LEADING, or being responsible with taxpayer money. She doesn’t know what she’s in for, just that she wants to defeat a Republican. Yes her complete lack of qualifications for this job are stunning and a bit scary. This job requires a smart, detail oriented, focused and committed professional. Nikita Richards is Tari’s and the elitist left’s Diversity Darling with her only qualification being she is a black woman who wants the power to address problems which don’t exist. One only has to look at the housing authority here to see that the “people of color” have first captured positions and then exploited them for their own and other people of color’s benefit. They are now a highly paid entrenched cabal who call all the shots. Nikita Richards wants money and power. This office is a means to an end. This is why she will do or say anything. She doesn’t really want the job… she wants power to move forward politically… this is merely a stepping stone toward her ultimate political goals. Nikita will not apologize. Renner her mentor never apologized for any of his bully tactics. They’re both of the current democratic swill of say anything, do anything, to bully their way to the top. Get the power and keep the power! That’s all it’s about for politicians like that, power. Hide incompetence with lies and accusations. Deceive to achieve is the democrat way. People are sick of this bs. Red wave in November. Previous Post Cadena Case: Sent in error means it’s mine!